At the renovated A4 sedan’s launch, Audi India had taken some unusual decisions with respect to the engine options offered on the A4. The German automobile maker sprung a surprise with the base version of the 2 Litre TDI turbo diesel engine, which is also sported by the Volkswagen Jetta and the Skoda Laura, against expectations of the 170 Bhp-350 Nm state of tune for this engine. Moreover, petrol-car drivers had to make do with the 1.8 litre TFSI turbo petrol direct injection engine, since no other options were available. The absence of a 3.2 litre TFSI engine was met with some disappointment. At the A4’s launch, Audi India made some positive indications about making the sporty and high-performance S4 variant available in the Indian market.As of now, the Audi S4 is undergoing testing and there is no reason for Audi not to launch it in India since Audi’s biggest rivals- BMW and Mercedes Benz- both offer entry level luxury sedans in India: the M3 and the C63 AMG respectively. Thus, the possibility of launching the S4 sedan becomes even more obvious since Audi India does not offer the 3.2 TFSI engine with the renovated A4 range. Now, the Audi S4 sedan will certainly be slightly different to the regular A4 variants. In terms of styling, the S4 will feature a lower front bumper, new headlights and a modified air dam to give it a sporty feel. It will also offer other colors to differentiate itself from the A4. The S4’s 18-inch wheels will give the sedan a commanding aura. Inside the car, Audi will make some changes to give the car a sporty feel, like sporty steering and a change in the materials used. 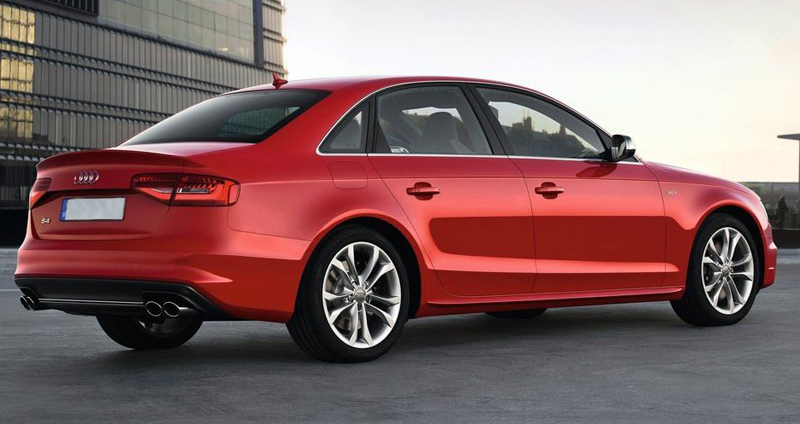 Overall, the S4 will be a very high-end model and will be the best sedan in the Audi A4 line. Of course, the pricing will be as glamorous as the car itself! The Audi S4 will be powered by a 3 litre TFSI engine giving 333 BHP peak power and a peak torque of 440 Nm. This great engine shall be ably supported with a 7-speed dual clutch automatic gearbox with manual S-Tronic shifting function. As you can expect, performance is pretty awesome with a 0-100 sprint in 5 seconds. However, the top speed is electronically limited to a blazing 250 Kph. The Quattro all wheel drive mode shall also be available on the S4 variant. Also, if the car is so sporty, its suspension must be cutting edge too! So the S4’s suspension is highly tuned to ensure sharp handling.